OUR PATIENCE IS RUNNING OUT ON GAS FLARING – Delta Communities Warn Nigerian Government; Petition U.N.
Women and men from over 20 Communities in Delta State Nigeria, have charged the Nigerian government to urgently take steps to put an end to the continued degradation of their environment, rights violation and destruction of their health and livelihood sources through continued gas flaring by oil and gas companies in the area or be prepared to face strong resistance to this evil act by community men and women. 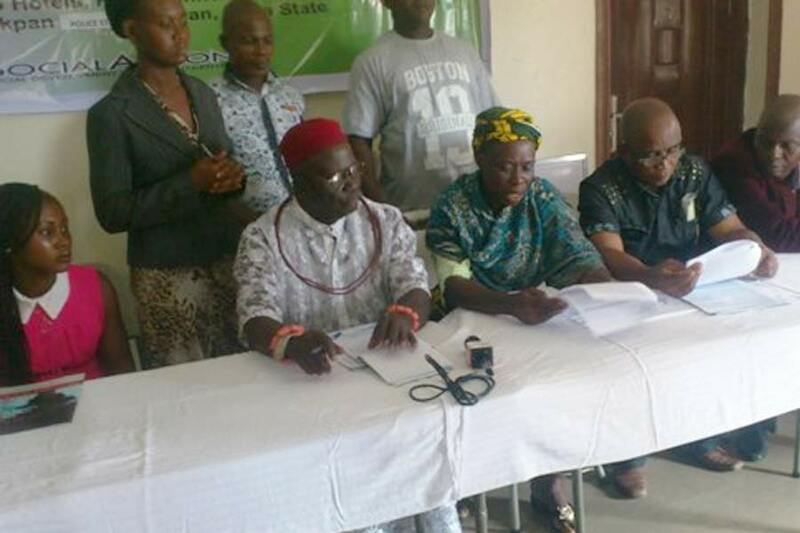 Representatives from the communities which include Okpai, Beneku, Ugboroke, Ugborodo, Ubeju, Oteghele, Edjeba, Ekrerhavwe, Batan, Agbon, Irri, Obodogwa amongst others made this warning at a Town Hall Meeting held in Warri, Delta State, supported by Social Action Nigeria, to launch its new report on ‘Gas Flaring, Communities and Carbon Trading in Nigeria’. The communities stated that their decades-long host of oil and gas projects and entities such as Eni-Agip, Xnergia, Seplat amongst many others have brought them largely misery, pains, conflicts, poverty and untowed hardships as a result of the poorly regulated manner these companies operate. 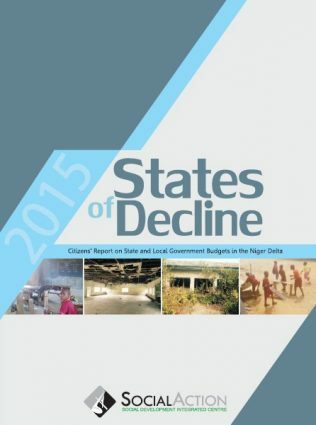 Citing several instances of projects without (positive) impacts, the community men and women explained that the Irri community in Delta State for example hosts the facility of about the third largest aviation fuel production in Africa, stating despite this, the community is a failure in all the indicators of (human, social and economic) development. They pointed out that gas flaring is an ecological genocide which is being committed against them and to which the Nigerian government conveniently and most appallingly turned a blind eye adding that the hardship they go through as a result of this was unimaginable. According to Joshua Ghereje of Omadino Community, Delta State”… the heat from in the atmosphere from the flaring is unbearable and when you talk they say pack out”. The community residents warned that their patience was running out on gas flaring and would be forced to take their own measures and steps to bring an end to the continued violation of their right to life and environment. Meanwhile, four communities made up of Irri, Okpai, Beneku and Obodogwa have jointly petitioned the Clean Development Mechanism, CDM Board of the United Nations Framework Convention on Climate Change, UNFCCC over “Ecocidal Carbon-Credit and Exploitation of the U.N Clean Development Mechanism, CDM by Eni-Agip and Xenergia in Kwale and Isoko Communities”. The communities which jointly endorsed the petition at the Town Hall Meeting, pointed out that there were inherent fraud, irregularities an abuse of due process in the manner and procedure of the award of the carbon credits to Eni-Agip and Xnergia by the CDM board even as they said, the companies still flare gas in increased volumes and called on the UNFCCC to cancel the award of carbon credits to the two companies as they failed by all standards and criteria including in emission reduction to qualify for such grants. 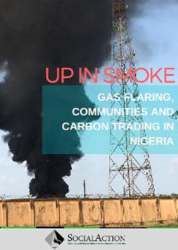 Earlier in her speech, the Head of the National Advocacy Centre of Social Action, Mrs. Vivian Bellonwu-Okafor explained that the meeting was to present and discuss findings of and issues related to its research on Gas Flaring, Communities and Carbon Trading in Nigeria as contained in its new report: “UP IN SMOKE”. She said the report made starting revelations indicating compromise of both persons, entities and organizations as well as procedures in the implementation of the U.N-backed Clean Development Mechanism in Nigeria. Bellonwu-Okafor said it was strange that two entiies; Eni-Agip and Xenergia whose projects in Kwale and Isoko communities were flaring gas without let or hindrance would be certified as a Clean Development Mechanism Project and consequently be awarded carbon credits with huge financial rewards; an act which she described as both an injustice and double jeopardy for the poor polluted host communities. She assured them that Social Action would support them seek redress over this . Bellonwu-Okafor called on Nigeria’s Minister of Environment and the UNFCCC not to sweep the allegations under the carpet but to immediately commence investigation into them with a view to correcting anomalies where identified as this would go a long way in healing wounds and calming frayed nerves of local community men and women in Nigeria’s oil and gas host area(s).